My latest PopMatters article interview is now live: iBeg: An Interview with Chris Worboys. I also recommend you read this Kotku article by Patricia Hernandez. I actually have a lot of problems with her article, and really the way games press examine social impact games in the first place, but that is for a different article. The piece is a decent quick look into some of the major issues facing the genre of so-called "serious" games. Chris and I specifically address some of the concerns raised by Patricia's piece as well. Of course what is true for regular games is also true for social impact games: good intent need not result in a good game. That being said, it does seem Chris is taking this game, and all the burdens it entails, with complete seriousness. 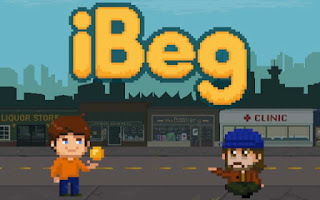 iBeg is not seeking to rid the world of homelessness completely with a single game, it will not even necessarily make a noticeable bump in homelessness in Vancouver, the city in-which it is based. Yes, Chris says in-game purchases will partially fund actual services and programs targeting the homeless, but the game clearly seeks to raise awareness more than it does to feed the homeless. The simple fact that money is going towards a program with amorphous measurements of success is controversial, yes, but this is not exclusive to social impact games. Patricia, in her article, talks to a representative at a homeless shelter and gets a predictable response: this investment money could actually go to a homeless shelter instead of game development. Why invest in an unknown reward when we have mouths to feed? For the five years I worked in the non-profit sector, this question was always on the forefront of peoples minds. NGOs the world over can't agree how to distribute aid, let alone win the hearts and minds of regular civilians, not to mention politicians and philanthropists. I do believe games and game developers have a place in changing our political and social landscape, in fact, they already do. While I am convinced iBeg comes from good intentions and has a designer dedicated to making a successful and tactful experience, I cannot promise it will be a success. Regardless, we need more designers willing to take risks in this space. We should be having these conversations more often, not less. If you're interested in checking out iBeg's Kickstarter page, you can find it here.